"Seven classical planets" redirects here. For Wandering stars that are not planets, see Wandering star (disambiguation). For the failed IAU planet category of Classical Planets, see IAU definition of planet. In classical antiquity, the seven classical planets are the seven non-fixed astronomical objects in the sky visible to the naked eye: Mars, Jupiter, Venus, Saturn, Mercury, the Sun, and the Moon. The word planet comes from two related Greek words, πλάνης planēs (whence πλάνητες ἀστέρες planētes asteres "wandering stars, planets") and πλανήτης planētēs, both with the original meaning of "wanderer", expressing the fact that these objects move across the celestial sphere relative to the fixed stars. Greek astronomers such as Geminus and Ptolemy often divided the seven planets into the Sun, the Moon, and the five planets. The term planet in modern terminology is only applied to natural satellites directly orbiting the Sun, so that of the seven classical planets, five are planets in the modern sense.
) for the Sun and a crescent for the Moon. The written symbols for Mercury, Venus, Jupiter, and Saturn have been traced to forms found in late Greek papyri. The symbols for Jupiter and Saturn are identified as monograms of the initial letters of the corresponding Greek names, and the symbol for Mercury is a stylized caduceus. A. S. D. Maunder finds antecedents of the planetary symbols in earlier sources, used to represent the gods associated with the classical planets. Bianchini's planisphere, produced in the 2nd century, shows Greek personifications of planetary gods charged with early versions of the planetary symbols: Mercury has a caduceus; Venus has, attached to her necklace, a cord connected to another necklace; Mars, a spear; Jupiter, a staff; Saturn, a scythe; the Sun, a circlet with rays radiating from it; and the Moon, a headdress with a crescent attached. A diagram in Johannes Kamateros' 12th century Compendium of Astrology shows the Sun represented by the circle with a ray, Jupiter by the letter zeta (the initial of Zeus, Jupiter's counterpart in Greek mythology), Mars by a shield crossed by a spear, and the remaining classical planets by symbols resembling the modern ones, without the cross-mark seen in modern versions of the symbols. 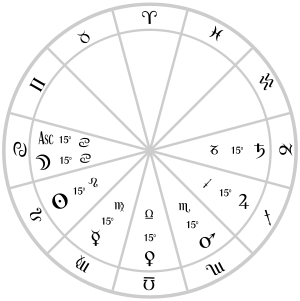 The modern sun symbol, pictured as a circle with a dot (☉), first appeared in the Renaissance. The Ptolemaic system used in Greek astronomy placed the planets in order, closest to Earth to furthest, as the Moon, Mercury, Venus, Sun, Mars, Jupiter, and Saturn. In addition the day was divided into 7 hour intervals, each ruled by one of the planets, although the order was staggered (see below). The first hour of each day was named after the ruling planet, giving rise to the names and order of the Roman seven-day week. Modern Latin-based cultures, in general, directly inherited the days of the week from the Romans and they were named after the classical planets; for example, in Spanish Miércoles is Mercury, and in French Mardi is Mars-day. The modern English days of the week were inherited from gods of the old Germanic Norse culture — Wednesday is Wōden’s-day (Wōden or Wettin eqv. Mercury), Thursday is Thor’s-day (Thor eqv. Jupiter), Friday is Frige-day (Frig eqv. Venus). It can be correlated that the Norse gods were attributed to each Roman planet and its god, probably due to Roman influence rather than coincidentally by the naming of the planets. In alchemy, each classical planet (Moon, Mercury, Venus, Sun, Mars, Jupiter, and Saturn) was associated with one of the seven metals known to the classical world (silver, mercury/quicksilver, copper, gold, iron, tin and lead respectively). As a result, the alchemical glyphs for the metal and associated planet coincide. Alchemists believed the other elemental metals were variants of these seven (e.g. zinc was known as "Indian tin" or "mock silver"). Extract and symbol key from 17th century alchemy text. Alchemy in the Western World and other locations where it was widely practiced was (and in many cases still is) allied and intertwined with traditional Babylonian-Greek style astrology; in numerous ways they were built to complement each other in the search for hidden knowledge (knowledge that is not common i.e. the occult). Astrology has used the concept of classical elements from antiquity up until the present day today. Most modern astrologers use the four classical elements extensively, and indeed they are still viewed as a critical part of interpreting the astrological chart. A table of alchemical symbols from Basil Valentine’s The Last Will and Testament, 1670 ce. Traditionally, each of the seven "planets" in the solar system as known to the ancients was associated with, held dominion over, and "ruled" a certain metal (see also astrology and the classical elements). Indian astronomy and astrology (Jyotiṣa) recognises seven visible planets (including the sun and moon) and two additional invisible planets. The cycles of the Chinese calendar are linked to the orbit of Jupiter, there being 12 sacred beasts in the Chinese dodecannualar geomantic and astrological cycle, and 12 years in the orbit of Jupiter. Mercury and Venus are visible only in twilight hours because their orbits are interior to that of Earth. Venus is the third-brightest object in the sky and the most prominent planet. Mercury is more difficult to see due to its proximity to the Sun. Lengthy twilight and an extremely low angle at maximum elongations make optical filters necessary to see Mercury from extreme polar locations. Mars is at its brightest when it is in opposition, which occurs approximately every twenty-five months. Jupiter and Saturn are the largest of the five planets, but are farther from the Sun, and therefore receive less sunlight. Nonetheless, Jupiter is often the next brightest object in the sky after Venus. Saturn's luminosity is often enhanced by its rings, which reflect light to varying degrees, depending on their inclination to the ecliptic; however, the rings themselves are not visible to the naked eye from the Earth. Uranus and sometimes the asteroid Vesta are in principle visible to the naked eye on very clear nights, but, unlike the true naked-eye planets, are always less luminous than several thousands of stars, and as such, do not stand out enough for their existence to be noticed without the aid of a telescope. ^ Sumerian names for the planet Saturn are Kâawanu and (Akkadian) Sag-uš "firm, steadfast, phlegmatic". ^ πλάνης, πλανήτης. Liddell, Henry George; Scott, Robert; A Greek–English Lexicon at the Perseus Project. ^ Mackenzie (1915). "13 Astrology and Astronomy". Myths of Babylonia and Assyria. ^ Pinches, Thophilus G. "5". The Religion of Babylonia and Assyria. Archived from the original on 17 December 2007. ^ Neugebauer, Otto (1975). A history of ancient mathematical astronomy. pp. 788–789. ^ a b Neugebauer, Otto; Van Hoesen, H. B. (1987). Greek Horoscopes. pp. 1, 159, 163. ^ a b Jones, Alexander (1999). Astronomical papyri from Oxyrhynchus. pp. 62–63. It is now possible to trace the medieval symbols for at least four of the five planets to forms that occur in some of the latest papyrus horoscopes ([ P.Oxy. ] 4272, 4274, 4275 [...]). That for Jupiter is an obvious monogram derived from the initial letter of the Greek name. Saturn's has a similar derivation [...] but underwent simplification. The ideal form of Mars' symbol is uncertain, and perhaps not related to the later circle with an arrow through it. Mercury's is a stylized caduceus. ^ "Bianchini's planisphere". Florence, Italy: Istituto e Museo di Storia della Scienza (Institute and Museum of the History of Science). Retrieved 2010-03-17.